Great Christmas game where everybody wins! Santa is delivering favorite foods to all the animals who are too curious to wait! 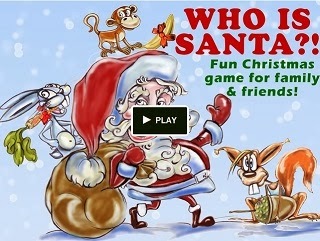 Print and play version of the game with funny cartoons for $1.00! SHARE the post about "Who is Santa?!" game on your timeline, COPY the exact same message as ours to go along with your share and drop us a line you did so. The game will be delivered on 23rd December so you will have time to print it and have a wonderful Christmas with your family! Have fun with your family at your Christmas table with this great tabletop game for just $1.00 !